The next fighter officially confirmed for Mortal Kombat 11 is The Kollector, one of the characters revealed via a roster leak a few weeks ago. "A proud servant of the Outworld Empire", the Kollector "cares only for his wealth and status and will kill anyone to keep it". At first glance he seems to have just the one extra pair of arms, but a minute into the brief teaser video shows another pair of limbs clinging onto his backpack. They only seem to get involved when it comes to the evisceration. 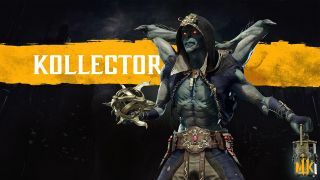 "A new fighter joining the Mortal Kombat franchise, The Kollector was born into poverty and seized his collections duty with a zeal that impressed Shao Kahn, becoming one of the Emperor's most feared associates," a press release states (thanks, Eurogamer). "As more of a corrupt, mafia enforcer than a government official, The Kollector stole riches from Outworld's people, rewarding himself with wealth and status in turn, but when Shao Kahn died, Kotal Kahn vowed to weed out the former regime's corruption. "After years in hiding, living off his ill-gotten gains, The Kollector was captured and now faces execution, determined to destroy anyone in his path." Not long to go now—Mortal Kombat 11 is out on April 23, 2019. To keep up-to-date on the very latest Mortal Kombat 11 news, bookmark our super handy hub page.